These terms and conditions may change from time to time. If such changes are made, they will be effective immediately, and we will notify you by a notice posted on our website’s home page of the changes that have been made. If you disagree with the changes that have been made, you should not use our website.We may terminate these terms and conditions of use for any reason and at any time without notice to you. All content on our website is owned by us or our content suppliers. On behalf of ourselves and our content suppliers, we claim all property rights, including intellectual property rights, for this content and you are not allowed to infringe upon those rights. We will prosecute to the fullest extent of the law anyone who attempts to steal our property.You agree not to copy content from our website without our permission. Any requests to use our content should be submitted to us by e-mail. If you believe that your intellectual property rights have been infringed upon by our website content, please notify us by sending an e-mail,or by sending mail to us at the address listed below. Please describe in detail the alleged infringement, including the factual and legal basis for your claim of ownership. The information on our website is provided on an ”as is,” ”as available” basis. You agree that your use of our website is at your sole risk. We disclaim all warranties of any kind, including but not limited to, any express warranties, statutory warranties, and any implied warranties of merchantability, fitness for a particular purpose, and non-infringement. We do not warrant that our website will always be available, access will be uninterrupted, be error-free, meet your requirements, or that any defects in our website will be corrected.Information on our website should not necessarily be relied upon and should not to be construed to be professional advice from us. We do not guarantee the accuracy or completeness of any of the information provided, and are not responsible for any loss resulting from your reliance on such information. Other company logos are the intellectual property of the respective copyright and/or trademark holders. You agree to obey all applicable laws while using our website.You agree that the laws of Colorado govern these terms and conditions of use without regard to conflicts of laws provisions. You also agree that any dispute between you and us, excluding any intellectual property right infringement claims we pursue against you, shall be settled solely by confidential binding arbitration per the American Arbitration Association commercial arbitration rules. All claims must arbitrated on an individual basis, and cannot be consolidated in any arbitration with any claim or controversy of anyone else. All arbitration must occur in Denver County, Colorado, USA. Each party shall bear one half of the arbitration fees and costs incurred, and each party is responsible for its own lawyer fees. These terms and conditions were last updated on 03-15-2012. 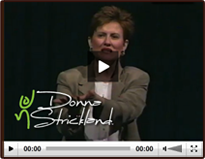 Copyright © 2012 Donna Strickland, and licensed for use by the owner of this website at www.donnastrickland.com. All Rights Reserved. No portion of this document may be copied or used by anyone other than the licensee without the express written permission of the copyright owner.